Over the weekend I made another trip over to Cincinnati - my 4th so far this year! This is a new record for me I think. Maybe I went over more back in 2004 when my dad was in hospice and then for his funeral and to empty then sell his home. I can't remember. But this trip was for a happy occasion. My aunt Margie, one of two girls remaining from my mom's family of eight siblings, turned 90 on July 21st. Margie is a ball of energy, driving herself where she needs to go, taking part in card games, singing and parties at the local senior center, and helping others get to their medical appointments. She looks fantastic and seems to be in great health except for her diabetes. But even that she keeps under control. She is just amazing. I arrived in town on Friday after stopping in Fort Mitchell, Kentucky to drive through a cemetery where my great-great grandmother is buried so that I could take pictures. Then one of the things that I absolutely must do in Cincinnati is eat Skyline Chili, and the cousins I was staying with were kind enough to oblige me and we ate there Friday night. Saturday morning my cousin Gina and I went downtown to Findlay Market, the oldest market house in Ohio, which opened in 1855. It consists of an open market, the enclosed Market House and a variety of store fronts surrounding the market area. The architecture in the area seems very European. I know that some of my early ancestors not only shopped here but also had booths selling food products. It is a thrill for me to walk in the area. We had a fun breakfast at a Belgian restaurant and then browsed the shops. I picked up some flavored sugar for coffee, tea and margaritas as well as some pickling cucumbers to bring home. We got back to Gina's house in time to shower and get dressed for Aunt Margie's party, which was being held at the home of another one of my cousins, though I don't believe I had ever met her before. There were over 50 people who attended the party, and I think Margie was very touched by the whole thing. It was especially wonderful to be able to spend time with the birthday girl and her sister Betty, brother-in-law Jack and their daughter Lynn. I don't get to see them nearly as often as I would like. Following the party I drove to the home of another cousin to see him and his wife for a few hours. Sunday morning my cousins had made reservations for us to have brunch with the birthday girl at Palm Court ind downtown Cincinnati. 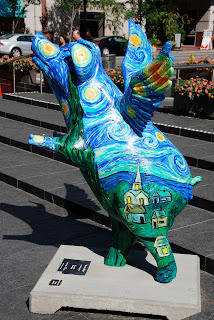 Since I would be leaving for home from there, Gina and I drove separately and had enough time to photograph some of the pigs gracing the city. 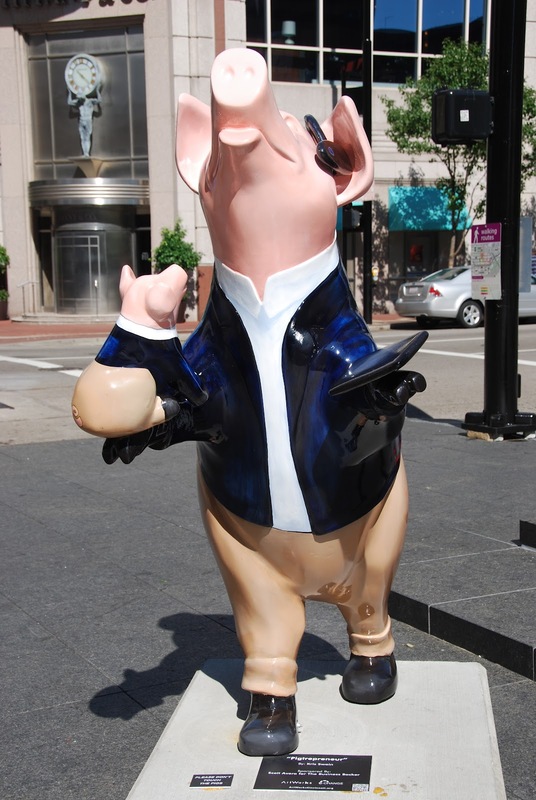 Part of the Cincinnati Big Pig Gig 2000, these pigs represent a small portion of the 425 decorated fiberglass pigs that were placed around Cincinnati and northern Kentucky that year. The pigs were later sold, raising $800,000 for local charities. 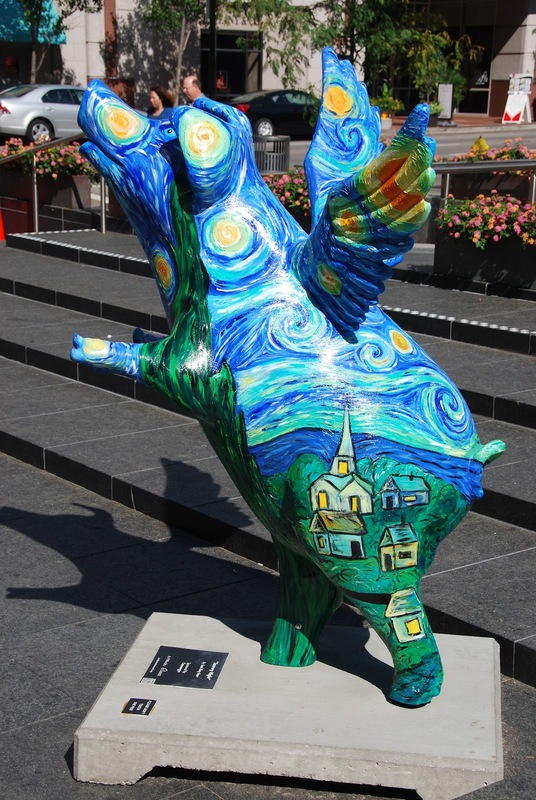 Because Cincinnati hosted the World Choir Games this summer, 20 of the pigs were wee-located (sorry, couldn't resist) downtown. Wish I would have had more time to find them all. Saturday morning at 7:45 a.m. we boarded the Amtrak train at the Kirkwood Station headed for Kansas City. My sister-in-law JoEllen was throwing herself a 50th birthday party at the Hotel Savoy, so we decided to take the train instead of drive. First of all, we just had the big drive up to Minneapolis last weekend and I am driving to Cincinnati for my aunt's 90th birthday party this weekend so I was not eager to do more driving. Second, it was only $116 round trip for the two of us to ride the train. It would cost me more than that to gas up my car. Third, it takes five hours to make the train trip, not much more than driving a car. So it seemed like a no-brainer, especially considering that we didn't need a car in Kansas City. The trip over was great. There were nice people in our car, which was good since you don't get to pick which car to sit in. We left Kirkwood right on time and actually arrived at Union Station about 10 minutes early. The only snafu was that we did not see any cabs outside the terminal, which is beautiful by the way. We ended up walking on an enclosed skywalk over to the Westin Hotel to catch a cab. When we came out the front door of the hotel I asked the door man to hail us a cab. As it approached, he asked me where we were going. I told him the Hotel Savoy. Boy did I get a dirty look! I guess I never thought how it would look to ask one hotel employee to get me a ride to one of their competitors. I told him that we didn't have a choice of hotels - that is where the party was taking place. He said, "I like parties!" I told him to come on over when he was done as we were taking over the whole hotel. When we got to the Hotel Savoy the lady at the front desk greeted us by saying, "You don't want to check into your room, do you?" I don't know - we just came in the front door with our luggage in tow, what do you think??? I explained that we had just gotten in on the train and came directly to the hotel. I guess it was about 1:45 by this time. She checked her records, stated that we must be living under a lucky star, and handed us a key to a room on the 5th floor. 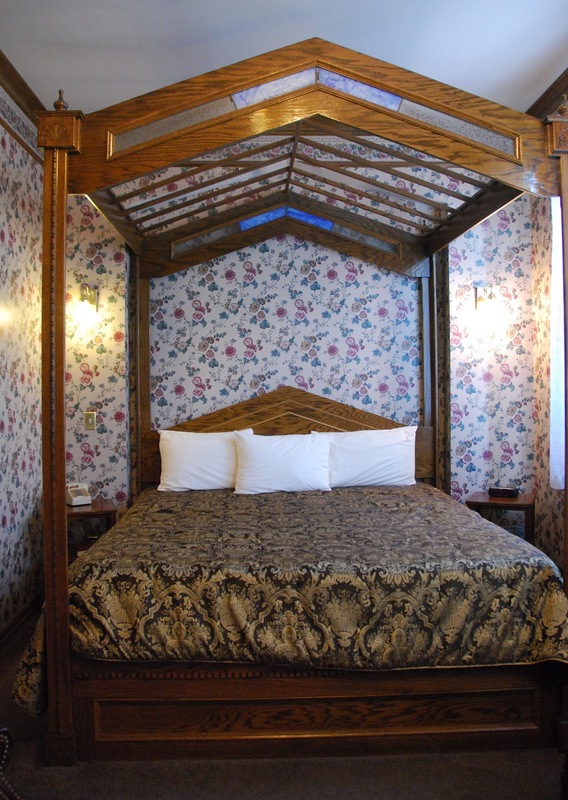 I should point out that this hotel was built in 1888 and is believed to be the longest continuously operated hotel west of the Mississippi. The current owner is only the third owner of the property. It has had its ups and downs, but he has been renovating rooms and turned it into a bed and breakfast of sorts. Only 21 rooms are currently available for use, we were told. The main floor has beautiful tile floors, more stained glass than I could count and beautiful wood surfaces. Our group was taking over the main floor banquet areas for the night. We took the elevator (which was hot) to the 5th floor, but we were later excited to see that the central staircase in the hotel had not been enclosed or destroyed. We took the stairs after that. As we rounded the corner to our room I thought the whole area looked like a scene from a movie. I turned to Jim and croaked out, "Redrum" in a reference to the line from the movie The Shining. Redrum is murder spelled backwards. I would later learn that I wasn't too far off. But I am getting ahead of myself...All of the hallways were really hot as well, so I was concerned about the room. I needn't have worried as the air conditioner was working fine. When we got to the room I unlocked the door with the brass key we had been given. Before I stepped in the room Jim asked if I wanted to take pictures. God love him, he knows that I like to take my photos before we clutter up the room with luggage so that I can place them on Tripadvisor.com when I do my reviews. So I dug my camera out of my suitcase and snapped some pictures. We then drug our stuff in the room. Our room was obviously not one of the recently remodeled ones, but it was quite charming anyway. Our bed had an interesting look to it, reminding me somewhat of a church complete with stained glass. The old claw foot tub added ambiance to the bathroom, but is pretty impractical for someone vertically challenged like myself. We heard some children running up and down the hallway, which I thought was weird because we understood that all the rooms were taken by attendees of the party and none of them were bringing children. When it was time to leave for the pre-party on the 4th floor, we could not find the room key. Neither one of us remembers removing it from the lock. We took everything out of our suitcases, my purse, checked pants pockets - nothing. Had it fallen in the hallway and the kids picked it up? Or was something else going on? I called down to the front desk and they had a second key for the room so he said we could just shut the door and it would lock behind us. First we went to the 3rd floor to get my sister-in-law Jenean. She had a beautiful suite with a small kitchen area and a fireplace. Her bed was so high off the floor, she did not know how she would get into it that night. We said we would come and give her a boost if needed. Then we went to the 4th floor. One of JoEllen's hearing aid patients is a photographer, and he volunteered to come and take pictures at the party. So he was busy snapping away as we all got acquainted in Bruce's suite, which was also very nice and spacious. (Bruce is JoEllen's fiance.) As the hotel allows dogs, JoEllen brought her two King Charles spaniels along. More on them later. At 6:00 we went downstairs for the party. All of the tables and chairs in the lobby were covered with linens and a pretty floral bouquet was at each table. Jim and I had been asked to sit at a table to hand our name tags, get folks to sign a guest book and ask them to fill out a sheet for the "Roast" portion of the evening. We could not find any of the things we needed for our job, so we just walked around introducing ourselves to people. We did not know anyone who was coming except the immediate family. A small buffet was available, offering fruit, cheese, vegetables with dip, scallops and stuffed mushrooms. Later some beef tips in gravy and some salmon were brought out. For dessert there was a gluten free cake, which was surprisingly good, cookies made by a friend, and lemon bars and brownies made by my mother-in-law, who was unable to attend. Beer, wine, iced tea and lemonade were available as well. Someone showed up with name tags and a marker and took them to each person, so I found the guest book and sent it around to the different tables. Jenean passed out the "roast" sheets. While we were eating an older gentleman gave a presentation on the Lewis and Clark Expedition, complete with animal hides. Bruce and a couple of friends played some music in the adjoining room, but to be honest it was so loud that I could not sit in there very long. The music was good, but my poor ears just couldn't take the volume. Around 10:00 the toast/roast began. One of Bruce's friends m.c.ed this portion of the evening. He pulled each completed sheet out of a box where he read the name of the person completing the form, how long they had known JoEllen and whether they were going to toast or roast her. Jim's name was called first, and mine was called second. Unreal. It was fun to hear what everyone had to say. JoEllen is universally loved and respected by the people who attended the party. I went up to the room around 11 and Jim followed around 12:30. I understand the post-party carried on until 2:30. I am amazed that we didn't hear anyone in the halls. The next morning we went down to breakfast at 9:00. They provide you with a sheet listing all the menu choices and you are allowed to choose 4 or 5 items from the menu and indicate what time you want your meal to be ready. The offerings were interesting in that you could get eggs, pancakes and assorted breakfast meats like normal. Or you could get pork, fish, veal or beef cooked a variety of ways. Juice, coffee, tea and cinnamon rolls were also provided. Jenean joined us and the staff showed us to a table in a small dining room. A large table of people from the party was already seated. JoEllen came in later and told us that we were supposed to be in the Savoy Grill, which they had opened just for JoEllen's party guests. She also told us that she was awakened at 6:00 a.m. to the sights and sounds of her two dogs vomiting and having diarrhea all over the room and on the bed. She woke Bruce up in his room and had him take the dogs back to their house. The hotel may ban dogs after this experience. JoEllen's college friend Laurie asked if we had heard that the hotel was supposedly haunted. I said no, we hadn't heard that. She proceeded to tell us what she had read online about a woman dying in a bathtub (room 505 - we were in room 542) who liked to walk the hallways. It seems she also likes to turn the water on and off and open and shut the shower curtain in room 505. Others had seen a man on the 4th floor who had been a resident at the hotel when they rented out apartments. When we talked to the wait staff, they concurred that ghosts are in the hotel. Jim and I went back to our room after breakfast to pack up and grab the camera so we could take some pictures of the hotel. As we opened our door to come out we heard a boy coming down the hallway. It sounded as if he was speaking in tongues as you couldn't understand a word he was muttering. When he saw us he gave us a furtive glance and stopped speaking. He proceeded down the hall in a robotic fashion, resumed his strange mutterings and turned the corner into the part of the floor being rehabbed. We hurried down the hall after him to see him disappear around another corner. He was banging on a door and we could here a little girl yelling, "No one is here!" and "You have the wrong room!" A man appeared out of a door at the end of that hallway wearing nothing more than boxers. At that point we scurried back to the staircase. Redrum...In retrospect, we think that members of the staff live in the hotel and that is why we heard the children because we saw others before we finally left that day. Following checkout we hauled all of JoEllen's gifts and flowers to various cars and went over to the house where she and Bruce live. We got to see her open her gifts, and she had prepared a late lunch for anyone who was still around. I think there were 11 of us there. Bruce then took us to the Lee's Summit train station, which cut about an hour off our trip because it eliminated two stops for us. It was closer to their house than Union Station, so that worked out well. Our train ride home was not as pleasant as the way over. First of all, the little girl sitting in front of us (around 8 years old?) did not shut her mouth even to take a breath. Yak, yak, yak! I put on my head phones and listened to music on my iPad. Jim didn't bring anything along and he finally got so desperate that he borrowed my iPod. I'm sure he truly enjoyed listening to Barry Manilow and Barbra Streisand! After a few more stops the train thinned out a bit so we made a mad dash to the back of the car. Then a guy got on and sat across from us yakking on his cell phone. And then he began to make all kinds of disgusting noises with his nose and throat. It was making me sick to my stomach. So we moved a few more rows back. Is there a website called PeopleofAmtrak.com like the one PeopleofWalmart.com? There should be. Nevertheless we arrived back in Kirkwood right on time at 10:00 and headed for home. What a fast-paced two days! Oh...and by the way? The first key never turned up. So was it the boy in the hall? Or the lady from room 505? Redrum! 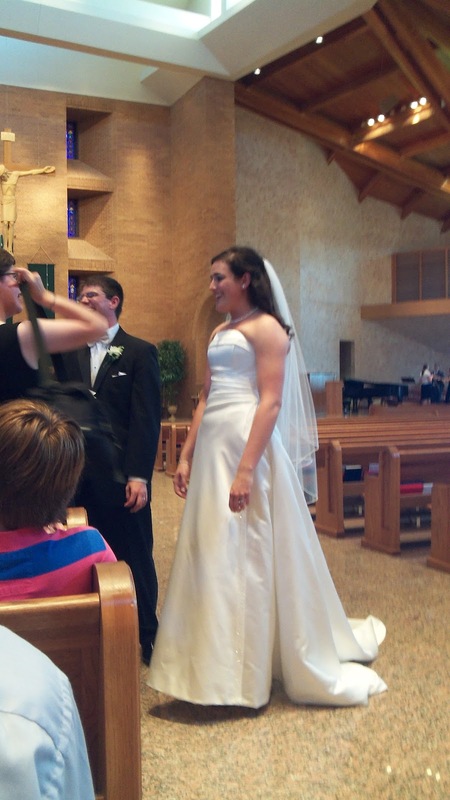 This past weekend we went up to Minneapolis to attend the wedding of the daughter of our good friends, Kathy and Paul. Kathy and I went to high school together, then on to Iowa State. Paul and Jim were fraternity brothers at Iowa State. Kathy and Paul sang at our wedding, and went with us on a cruise when we celebrated our 30th wedding anniversary. we have traveled together multiple times in the four years since then. They are the first of our friends to have a child get married, and considering our connection it was great fun to be there for their daughter's wedding. We did not know anyone else at the wedding, so that was a little strange but we met some interesting people at our table and had fun dancing at the reception. The wedding cake was amazing. 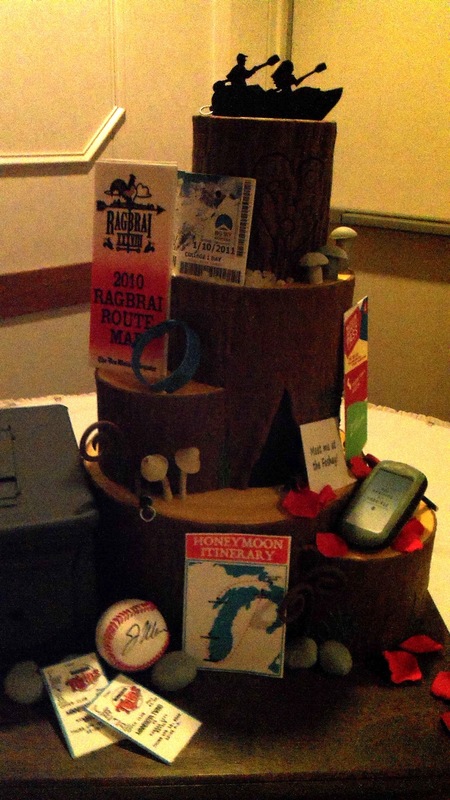 Rox and Dan both enjoy outdoor activities, so the cake was designed to represent the things that they like to do. Absolutely everything you see in the picture (poor quality but I did not bring my good camera up to Minneapolis unfortunately) is edible, including the baseball. The cake decorator must have had a ball, pardon the pun, designing this cake. The next morning Kathy and Paul had their family members and the out of town guests over to their house to watch the "kids" open their presents. We actually had a little more time to talk to the two of them at that point, so I am glad we went. We also met another couple who live in Iowa and graduated from Iowa State. Interestingly the husband graduated with a degree in horticulture, so he and Jim got to chatting about that and landscape architecture. The wife said that she started out in one major but changed her sophomore year. So did I. She graduated with a degree in Family Environment. So did I. 1978? Yep. Her area of concentration was Family Services. So was mine. We had to have taken a class or two together somewhere along the line. What a small world! I wish we had sat with them Saturday night so that we could have talked more. All the driving for this particular wedding left a bit to be desired though. We left St. Louis on Friday and stopped in Charles City to spend the night with Jim's mom and dad. They had agreed to keep the dog for us. I think they were more excited about having Kirby stay with them than seeing us! Not really, but they do enjoy him. Saturday morning we headed back up the interstate for an additional three hour drive. We were able to check into our room early, which was nice so that we could freshen up before the wedding. On Sunday we headed back to Charles City and stayed the night again there. Then Monday morning it was back on the road to St. Louis. 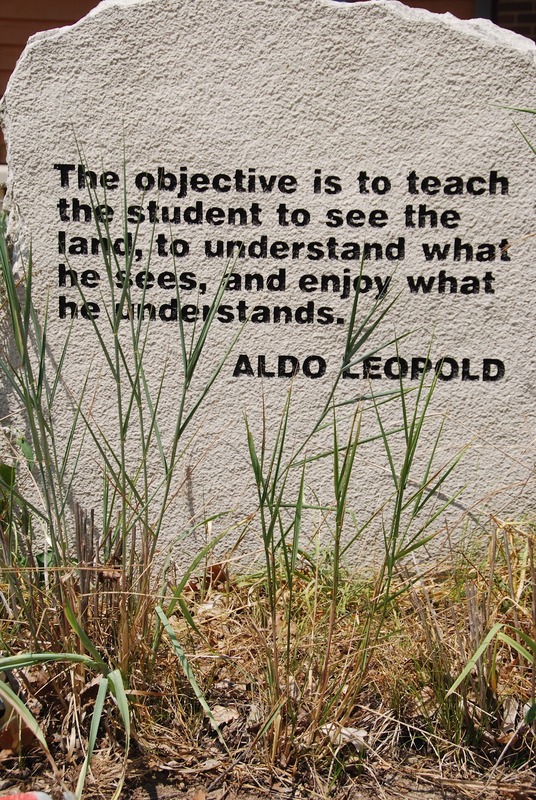 On the way home we stopped at Wickiup Hill Outdoor Learning Center, which was a good spot to walk the dog. They have multiple trails you can walk on, but it was pretty hot so we took the path to the wetlands. It has a really cool wooden plank walkway out over what normally is the wetland area. It should be renamed Drylands as there was not a drop of water to be found. It made me wonder what happened to all the wildlife that normally lives in the area. So sad. Unfortunately we all picked up a few ticks in the park. Yuck! This has been a pretty busy summer for us, and there is no end in sight. Three of the four weekends in July we have full schedules. So far only one weekend in August is taken, so that is kind of a relief.